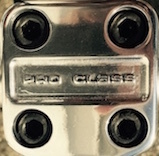 1983 Mongoose Proclass 20" originally in Smoke Chrome/Black Chrome which was stripped off by previous owner. Pro Class 175 crankset with Power Plate,SR 211 chainwheel, pro class chainring bolts, Shimano DX pedals(Since been completely restored and polished like new) stamped bottom bracket, Stamped Pro-bars(uncut), Pro Class stem, OG date stamped Tech4 levers, but found Tech2 '82 date stamped levers now. Black 5/83 date coded D/C MX900 rear(replacing with '82 date coded Chrome MX1200 now) and Black 5/83 date coded MX1200 on front(replacing with chrome dated coded 5/83 MX900 now) front and rear cables DC date coded 12/83, Will be installing the Mongoose stamped headset,. Proclass wheels with original ACS hubs, White Industries freewheel and fat and skinnys skin wall comp 3 tires. Blk/Red pads n.o.s OG out of the original bag, blk/blue Proclass Pads are repop but I like the look better. Chrome seat post with real D/C seat post clamp, original Viscount Areo seat. Bout it, hopefully have updated restored pics soon. If anyone knows of a place that can replicate the Black Chrome, Id appreciate the info very much. So far no luck with shops here or on the mainland. Even C4 Labs said no can do. I think I found someone who can replicate the paint here, it will be automotive paint painted by the top hot rod/custom chopper painter here in the islands that says she has a way to do it. Just need to strip the remaining chrome and get the paint going. Have 3 sets of decals to choose from, leaning towards the custom red lettering(instead of the correct blue) just because I like the look. Pretty much have all the rest of the parts I need(unless someone is holding Proclass Crank caps)? Of My Moosegoose with Freemag Motomags, all OG decals, stainless stamped everything, sued seat, or my unrestored, original decal supergoose with correct parts, my Team Goose, Race Inc 20" and 24" aluminums, the Proclass is only second favorite to my 1979 Cook Bros 3 Bar 26" cruiser which is a tough bike to beat! Still I love the geometry and feel of the 20" Proclass only second to the Eric Rupe but its a close one between the two. I highly recommend any Mongoose fan to try one if they never have, they are great bikes! Thanks for looking, and those who have n.o.s. Black chrome f/f I am very envious of you. Best color bike from the mid 70s through mid 80s in my opinion. I am seriously Looking for a 24" pro class F/F, Eric Rupe F/F, and nice Black Chrome Proclass 20" F/F if anyone is selling too? Mahalo for creating this group! Hit me up if you have any of these to sell or trade! Have never ridden one but I've always loved these, from bitd to now! I know you're getting this refinished and I'm sure it will look great but I really like the stripped/raw look of this frame! Very either way! Check out my 1983 VDC-built Trident, 1983 Kuwi Laserlite, 1984 Redline 500a and 2011 Crupi race rig, plus the all things Crupi & old school scene in Japan threads. Nos, most chromers won't touch it because with EPA regs, they can't make it durable enough. Chromemasters told me of a shop near them that would do it but they wouldn't recommend it. I think if you were to do a trans black powder over Chrome, that would look pretty close and be pretty strong. Would love to find my old Dirt Bike. It was stolen in Pompano Beach, Florida in about 1996. It's a '92 with the block graphics on a Green frame. Pitchforks, Slam bars, GT (DK-style) stem and GT/Profile cranks. Superlace hubs. Would really love to put this back in my collection. D, you talking about a place here or on the mainland? Where's this Chromemasters, are they local? I was told we don't have any one who could do true 3 stage chroming due to the local laws? I would send my stuff to the mainland to get chromed but Marlene said if I can strip off the old chrome smooth, she has some new paint she can mix with some other paint to get a pretty close look. Worse case, it has a real nice paint job even if its not exactly like the factory black chrome look? Hopefully get a Eric Rupe or a n.o.s. ProClass in black chrome f/f at some point and I can sell off some of the other bikes(yeah, lots of dreaming there and denial ) Hope all is going great with your new venture bradda! Alohas! There is a place in the UK that does black/chrome finish on the Raleigh guys Night Burners etc. The owner of the company (Imprezzive Finishes) is a member on RADBMX. Also Superbike Dan (RADBMX member) is the man for PC/painting frames in the UK (like Chip in USA) and may be able to help you .. I also recall hearing about a place in Australia that had done a few black chrome bikes. I'll see if I can find any info on that one. Try contacting The1980s and Vos who are both members here and have their PC finished in black. They shall grow not old, as we that are left grow old. Age shall not weary them, nor the years condemn. At the going down of the sun and in the morning, we will remember them.